It’s being touted as a replacement for the gas tax, but the VMT fee is a flawed way to pay for roads. We should adopt a pricing system that reflects impacts on the environment, wear and tear on the roadway, and the costs of congestion, not just how far a vehicle is driven. Chances to change the way we pay for our transportation system come along about once a century, it would be a shame to get locked into a flawed, second-rate system. At City Observatory, we’re big believers that many of our transportation problems come from the fact that our prices are wrong – and solving those problems will require us to get prices right. While we desperately need a way to pay for roads that better reflects the value of the space we use, just moving to a new model isn’t enough. If we don’t get the new pricing system right, it could make many of our transportation problems worse. As the old adage goes, the devil is in the details. There’s growing interest, and even some state experiments with a “vehicle miles traveled” fee (VMT) fee. This would basically tote up the number of miles a car is driven each year, and charge a price per mile (a few cents). Interest in the VMT fee has been prompted by the advent of fuel efficient vehicles and electric cars, which have cut into gas tax receipts. While a VMT fee has some advantages over a gas tax, its a far from optimal way to pay for roads, and send the right signals to road users about how their choices affect the transportation system and society. Technology and consumer acceptance have blown past the simple-minded idea of a VMT fee. Nearly all American adults already have smart-phones and other GPS-enabled devices that track their locations in real time. Uber and Lyft have conditioned urban travelers to paying a la carte for time and distance (and paying a surcharge when demand is particularly heavy). Insurance companies and telecommunication firms have developed the mileage tracking dongles that plug in to cars’ data ports. Shortly, new cars will have sophisticated vehicle-to-vehicle communication built-in. So as we think about how to design a road finance and pricing system to replace the gas tax (and other taxes), we ought to have a system that accounts for all the cost-drivers associated with travel: heavier vehicles that cause more road wear should pay higher fees, as should vehicles that pollute more. How much you pay to drive on a road should be related to how much that road costs to build and maintain. Use a congested urban highway at the peak hour, and you’ll pay a higher fee than if you use a rural road at 2 am. In short, American cities have too much traffic today for the same reason that the old Soviet Union always had bread lines: we charge too little for a scarce and valuable commodity. 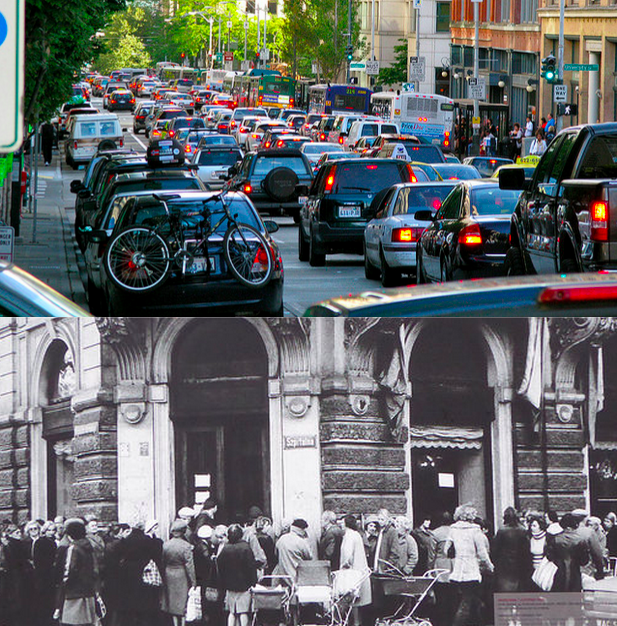 As a result, people consume too much, and we end up rationing access by making people wait. Similar ideas. Top: Oran Viriyincy, Flickr. Bottom: Jake, Flickr. The main way we price road travel today is the gas tax, but it doesn’t send the right signals to travelers about how much different kinds of travel, in different places, at different times, actually cost. In contrast, the proposal to replace the gas tax with a vehicle miles traveled (VMT) tax – directly charging people by how much they drive – is clearly a step in the right direction. With great fanfare, the State of Oregon launched its road pricing demonstration program, OReGO, three years ago. Under this voluntary program, up to 5,000 motorists were supposed to sign up to pay a per mile fee of 1.5 cents rather than state’s 30 cent state gas tax. Motorists had two different options for monitoring their mileage: one that periodically reads the vehicle’s diagnostic data port, and another that uses GPS technology. For those hoping for a sensible alternative to the gas tax, the VMT fee seems like a big improvement. CityLab’s Eric Jaffe was enthusiastic about this kind of mileage fee concept, listing 18 reasons why it’s a good idea. While the concept of charging more for the roads, and charging in a way that reflects the cost of use – including contributing to congestion, road damage, and pollution – is essential, Oregon’s VMT fee does exactly none of these things. The crux of the problem is that 1) it raises no more money than the current gas tax, and 2) it ends up subsidizing heavier, more polluting vehicles while actually punishing lighter, more fuel-efficient ones. For many, the primary reason to favor a VMT tax is, as Eric Jaffe puts it, to “raise a gargantuan amount of money.” That would replace the gas tax, which, according to accepted political wisdom, is a dying revenue source. But VMT may not be a revenue panacea. For one thing, total driving in the US has declined in the past, and is likely to decline in the future. Moreover, if we tied the tax to VMT—and set the tax at a high enough level to produce the “buckets” of revenue that proponents want–we’d expect that people would do what they normally do when something gets more expensive: do less of it. It also turns out that the gas tax is more proportional to the physical damage vehicles cause to the roadway and to the environment. A gas tax functions very much as a carbon tax (albeit a very low one): the more you pollute, the more you pay. But shifting to a tax based solely on mileage, without regard to how much pollution a vehicle creates, would essentially tax hybrids to subsidize hummers. The flat, undifferentiated VMT fee would be like a butcher that charged a single price per pound for every cut of meat in the shop. You’d quickly find that you would have long lines of people lining up to buy steak and you’d end up throwing out over-priced hamburger that no one would buy. A key part of a VMT fee should be its ability to signal to users how much travel costs to society as a whole, depending on when, where and how they do it. A flat fee per mile, whether it’s in Manhattan, New York or Manhattan, Kansas, or at 5am or 5pm, will do nothing to encourage people to use cars at more efficient times or places, or to choose to take transit, bike, or walk instead. Getting a VMT fee right is going to become increasingly important, because the problem of mis-pricing and under-pricing road use is going to become much worse in the years ahead. The business models of Uber and other “ride-sharing” services are predicated on very low-cost access to the public right of way. Already, there is evidence that the growth of Uber and other for-hire vehicles is putting further strains on the very limited street capacity. In New York the number of for-hire vehicles in the city has grown 63 percent since 2011, and traffic speeds on Manhattan streets have fallen 9 percent since 2010. Slower traffic has resulted in slower rush hour bus service, and contributed to declining Manhattan bus ridership, which fell 5.8 percent last year. It’s tempting to treat road pricing as just a way to raise more money for construction and maintenance. But that would be a huge mistake. If we get the prices right, we can make a significant dent in congestion by signalling to travelers how to make more efficient use of the roads we have, avoiding the need for expensive new capacity. Already, we have good models of how this works with congestion pricing systems that vary by place and time of day in London, Stockholm and Singapore. San Francisco has implemented variable pricing for parking. New York, Los Angeles and Chicago are all actively exploring proposals to implement various forms for road pricing based on time of day. And the evidence from earlier experiments in Oregon is clear, while a flat VMT fee has very little impact on peak hour travel, a fee that ranges from .4 cents a mile (off peak) to 10 cents per mile during peak hours in the central city would reduce vehicle miles traveled by more than 20 percent. Oregon now seems set to leapfrog the VMT fee. The 2017 state legislature directed the Oregon Department of Transportation to seek federal permission to implement value pricing in Interstate 5 and Interstate 205 and other freeways in the Portland metropolitan area. The state’s proposal due to the US DOT by year end. Based on the latest iteration of its long-awaited infrastructure proposal, the Trump Administration is favorably disposed to letting the states make the the call on tolling existing Interstates. Our transportation problems are–at their root–a product of getting the prices wrong. If we adopt a new way of charging for public roads, we have a once in several generations chance to get the prices right. Let’s not blow it by failing to make sure that the way we price roads and travel sends the right signals to everyone about how, and when to use the roads.